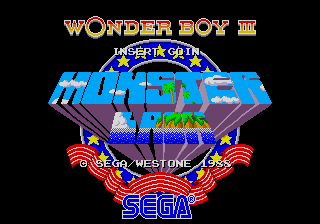 Wonder Boy III: Monster Lair (ワンダーボーイIII モンスターレア) is a Sega System 16 game in the Wonder Boy series. It is not to be confused with Wonder Boy III: The Dragon's Trap, which is actually the fourth game in the series that was mislabeled in localization. It is the last game in the "Wonder Boy arcade trilogy". It was later ported to the Mega Drive. Strangely, it was also brought to the PC Engine CD as an actual Wonder Boy title with no alterations, though only the Japanese box has the "Wonder Boy III" mark on it. Even stranger is that the Mega Drive version was not released in North America while the PC Engine CD version was. Monster Lair is unlike other games in the Wonder Boy series, though it at least resembles the original more than it does the various Monster World games. Though it still contains platforming segments, Wonder Boy's sword fires projectiles, and the screen auto-scrolls to the right. The Mega Drive version of the game has been brought to the Wii's Virtual Console service. Monster Lair was ported to home platforms relatively unscathed, although on the TurboGrafx-CD version lacks parallax scrolling and the Mega Drive version has entirely re-drawn graphics to better suit the hardware. Main article: Wonder Boy III: Monster Lair/Magazine articles. Main article: Wonder Boy III: Monster Lair/Promotional material. NEC Retro has more information related to Monster Lair.